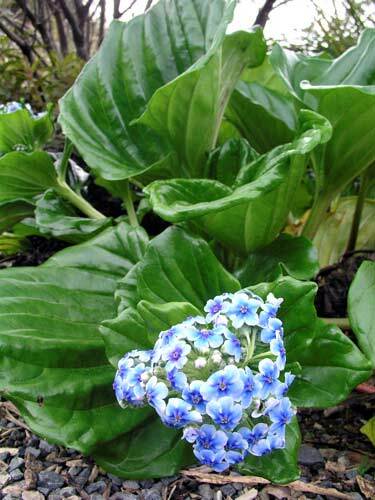 With their thick, glossy leaves and spectacular blue flowers, Chatham Island forget-me-nots (Myosotidium hortensia) are one of the most attractive of New Zealand’s herbaceous plants. It is not a true forget-me-not (Myosotis species), but was given the name because its flowers are very similar. There is only one species of Myosotidium, and in the wild it grows on exposed coastal sites in the Chatham Islands. In gardens the plant needs shelter from frost and some shade during hot summers. It prefers a well-drained, compost-rich soil.